Self Catering holiday accommodation conveniently located near Ruffec, between Poitiers and Angouleme in the Charente, SW France. Our child friendly gite offers a flexible self catering holiday let in the Charente with an bove ground pool, trampoline, swings and slides on site! 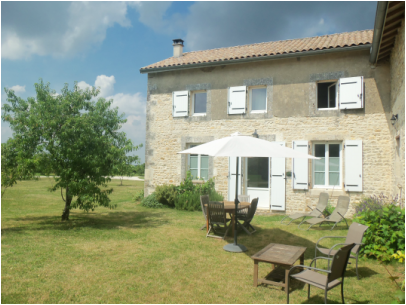 Flexible accommodation, 2 options available, either a 3 bed, all with en-suite facilites, gite for large parties or a 2 bed, both with en-suite failities. See 'Accommodation' for more details. As well as gite accommodation, we can also offer bed and breakfast throughout the year plus long term lets. Set in 2 acres in a small hamlet surrounded by fields of corn and sunflower our gite/b&b accommodation is a home from home. We are in a rural location yet only 3 miles from all amenites. Renovated to a high standard but keeping a lot of Charentaise charm, we are sure you will love your stay with us. Also available for rent as a long term winter let. Availability All Year!